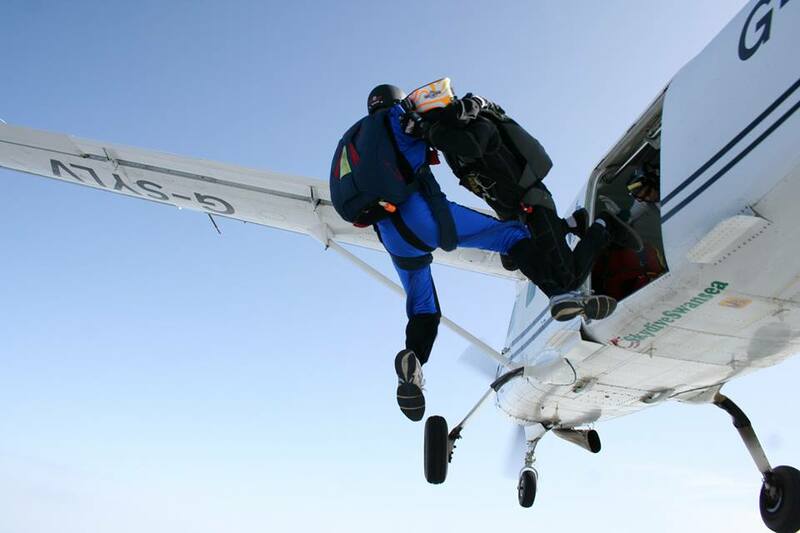 The plan for this jump is another pre declared landing after edging my way closer, and to stay stable on my back for as long as possible, so I dive exit the plane, straight down, and turn onto my back, and stay there, keeping myself stable, and checking my altitude every few seconds. I turn back onto my front at around 5,000 feet, then deploy my canopy at 3,500 feet. Like the last descent, i keep the landing area behind me and to my right, and i only turn right to catch the wind, then left back into the wind. After a few turns, ive lined myself up so im at around 800 feet, ready for my last turn with the flag about 500 yards behind me, and about 300 yards to my right. I turn right, so the wind takes me, keeping my eye on the flag (after checking for any other canopies around, and above, me), then when im in line with the flag, i turn left back into the wind. The flag is just in front of me, but nearly directly below me, I hold keeping into the wind, flare and land, and turn and collapse my canopy, and I’m about 20M past the flag 😀 its a successfull pre declared landing, on my last jump of the day. After the last jump, this is going to be another pre declared landing, but the plan for the freefall itself is to just try different body positions, and keep myself stable. Im due to be second out again, with a group leaving before me, the group leave, and about 10 seconds later, so do I. I dive exit, and get stable, then slowly turn a full 360 degrees trying to spot the group who exited before me, with no success. 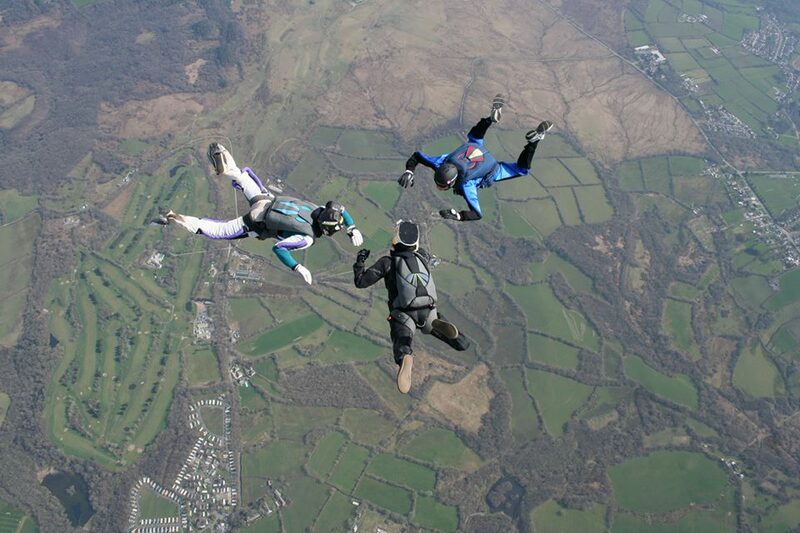 I throw a few shapes just to see how my body reacts, and keep myself stable, whilst keeping aware of my altitude, and when im around 6,000 feet, start to see the canopies open of the group who exited before me, over to my left. I open at 3,500 feet, to be greeted with one end of the canopy closed, and im starting to turn, i reach up, grab the steering toggles and give two good hard pulls, which makes the end pop open 🙂 and i head to my holding spot, which is quite a distance from the landing area, turn into the wind, and look straight down, and, im not really covering any ground at all. This tells me that for my final approach, i really need to be nearly above where i want to land. 2,000 feet, turn so the wind takes me closer to the landing area, and turn back into the wind, and once again, look straight down, not making much forward ground at all. 1,500 feet, another turn with the wind, then turn back, and look straight down, and the same again at just under 1000 feet. At 500 feet, i turn so the wind takes me and prepare to line myself up with the flag, turn back into the wind, and im a little further away than id like to be, so pull slightly on the front risers, and while this does get me further forward, it also drops my height a little faster, so at just under 200 feet, i ride it out the rest of the way in, and land about 40M from the flag, a good standing landing, before turning and collapsing my canopy. For this jump, ive pre declared my landing, meaning i have to land within a 30M radius of the blue flag in the landing area. In the plane on the way up, i decide that ill just chill out with some 360 turns on the way down and concentrate on getting my landing on target, on the last jump i was just over 30M from the flag, so im confident i can get closer this time, for my 3rd of 5 pre declared landings on my paperwork. As im right in the door, and will be second out, i ask Rob, whos an instructor, and the jumpmaster, if i could have a go at spotting, as on my last go, while i was successfull, there was more cloud about then there is today, he says ‘sure no problem’ and for me to tell him when we are directly over the dropzone. The door opens, my heads out, and a minute later, i give Rob a thumbs up, and he confirms 🙂 I move back to let the first group of jumpers out, and i follow shortly after. In the door, i turn back into the plane, and just fall backwards, out of the door 😀 watch the plane vanish, before flipping over, and practising some turns, as well as de-arching, and arching hard to feel how my body feels in these different positions. I pull at 3,500 feet, and turn straight into the wind. I hold my position untill around 2,000 feet, before turning and heading towards the landing area, then turn back into the wind, with the landing area behind me, and to my right. I look straight down, im moving forward, but only slowly so i turn again, then turn back into the wind directly over the landing area. Im now at 800 feet, with where i want to land below me and to my right, this is all going to plan perfectly. I turn right, get taken by the wind, and immediatley turn left, and am perfectly in line with the blue flag right in front of me, but, im not moving forward enough. I pull the brakes slightly to try and extend how far i’ll reach, but, as im going into the wind, this has the opposite affect, and actually blows me backwards, so i reach forward and gently pull the front risers a little. At about 150 feet, i know im not going to make my target as i simply dont have enough height left, so i keep heading towards the flag, and land about 45M from it. This is an unsuccessfull pre declared landing, but, it is a tick in the box for extending the range of the canopy using the front risers. 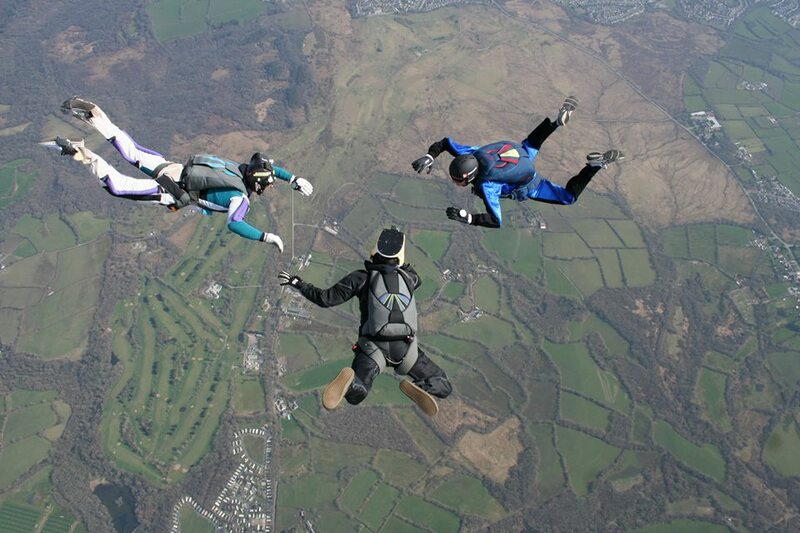 We go through how to exit the plane together, what to do immediatley after exiting, and plan to just fall together, with a few turns, just to see if i can stay level etc, excited much? YEP!! In the door, we exit as planned, but the smoothness of it wasnt quite as planned :p after a little bit of upside down and turning fun, we get stable, then i see Seamus to my right getting closer. I let go of Darren with one hand, and the 3 of us link up, we then all let go slowly, and stay pretty stable, or, should i say, they stay stable with me, as i notice them both making small movements so we all stay together. Under canopy, i head for the holding area, and turn into the wind, and look straight down to see how fast im moving forward, not very fast at all, so i turn closer to the landing area a few times, before starting my final approach at 1000 feet, and after my final turn into the wind, im dead in line with the blue marker flag, and land approx 30M from it, before turning and collapsing my canopy. 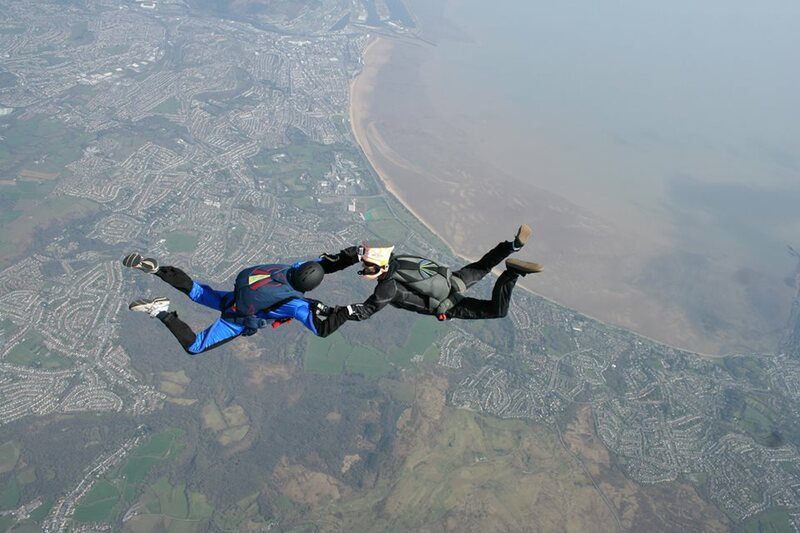 For this jump, im back on a 240 canopy, as theres now quite a few club jumpers and students all using the hire kit. After speaking with another jumper, im going to try recommended different body positions, which when jumping with other people, will slow your fall, or speed it up. I roll out of the door, and get stable on my back and watch the plane move away, before flipping over, and trying these body positions, before deploying at 3,500 feet. Turned up nice and early at the dropzone, as the weather says that the winds will gradually get worse as the day goes on, but, even though the northern landing area was in use, and i was all kitted up to jump a 230 for the first time and ready for checks to get on the plane, a few of us were told that the winds were too high for us, so a jump limit and canopy limit was put in place. 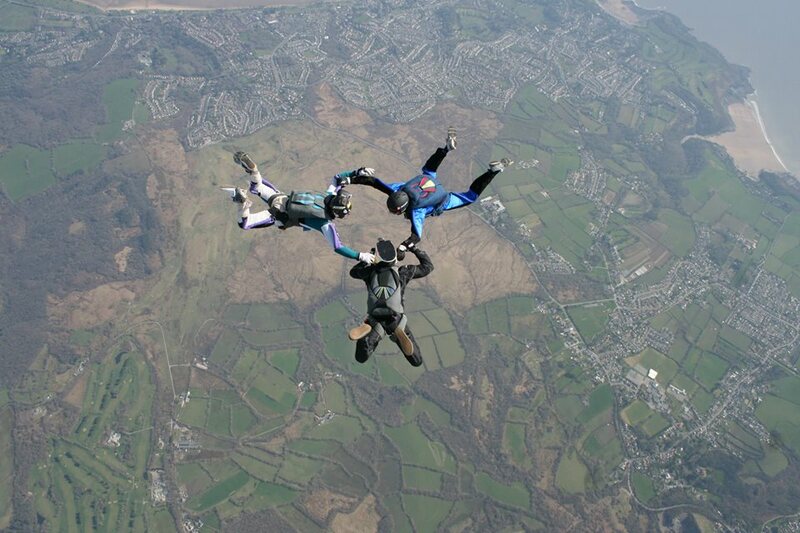 Helped out catching tandems in the hope that the winds would drop, but, by dinner time, all jumping was cancelled. Turn up at the dropzone for an afternoon jump, and get on the board for in about an hours time, so help out catching tandems. In this hour, the clear blue sky starts to fill with patches of cloud that start grouping together. By the time we get up in the air, theres some pretty large patches floating around, and in the plane on the way up, we are told that we may have to go back down. Im due to be first out, so am sat right in the door, and looking through the holes in the cloud. At jump height, the jumpmaster points out to me the end of the runway directly below us in a perfect hole in the cloud, and gives me the thumbs up, I dont need telling twice, and roll out of the door. I get stable, and as im first out again, i turn and do a good 20 second track away from the plane, this is brilliant fun, proper like superman, flying through the sky, i think next time, ill try it with the one arm out :p after this, a few fast 360 turns, before turning back to face the runway, but, below me, either the hole has closed up, or ive tracked quite far and am now over somewhere that im not too sure about. A few S turns to get rid of a bit more height, then at 1000 feet, start my approach. During my crosswind part, and while watching the windsock below me, the direction of the wind changes by around 60 degrees every now and then, so my crosswind is half the time into wind, so i abandon the idea of making it to the blue flag, as im being blown sideways too much, so i turn into the wind at about 500 feet, and just keep adjusting my direction slightly to stay in the wind. my backwards exit still turned a few times, then i did a few backflips, 360 turns and a little tracking in the direction the plane had come from, as i knew there was no danger of there being anyone there, and i think this was the langest track ive done so far, before opening my canopy at around 3,500 feet.